MADACC cares for approximately 10,000 stray neglected, abandoned, and injured animals each year and your generous donations help keep them safe, healthy and comfortable. MADACC is always happy to accept donations from the public. Canned cat food and dry dog and cat food are always our biggest needs year round. 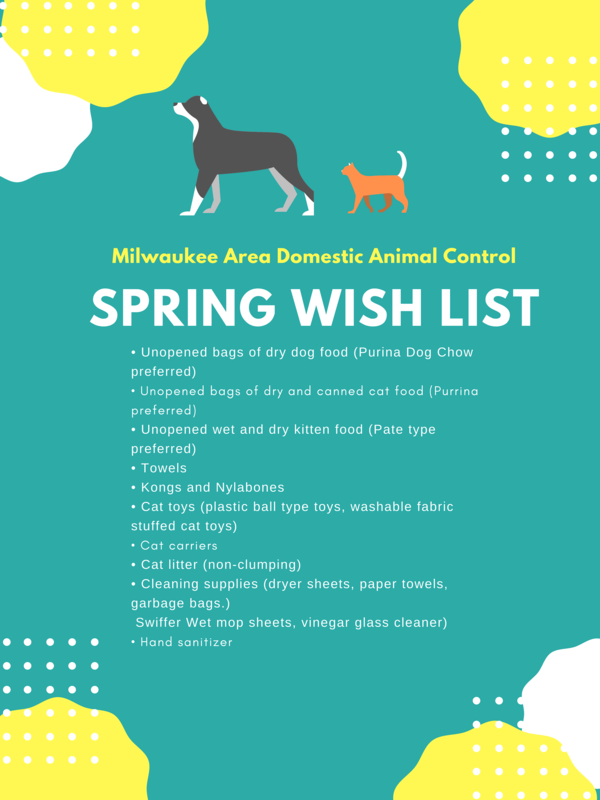 We cannot accept open bags of food, and suggest you bring those to Wildlife in Need in Oconomowoc for their wild animal patients. MADACC also accepts financial donations that are put into our animal medical care fund for animals who need extraordinary care while in our facility and our spay/neuter fund that is used to give animals who are not reunited with their families a second chance and be put up for adoption. You can also learn about MADACC’s Planned Giving program by clicking here. MADACC’s wish list provides you with a list of our current and most important needs. We are not able accept prescription medications and prescription foods. We are able to accept non-expired heartworm and flea treatment for dogs and cats. We have several Amazon Wish Lists for the animals in our care. Can’t adopt at this time? To sponsor a pet, click HERE. Then choose an animal and click on the profile. You will be given the option to “Sponsor Me.” You can then choose the amount to sponsor! The MADACC Cage Comforter Program enlists volunteer sewers to make small comforters and toys for the kittens, cats and small dogs in our care. Our animals love their comforters! The comforters not only ease the stress of our homeless animals, they also help to ease the transition when the animals are transferred, because they take their comforters with them to our animal placement partner organizations. Because of the number of animals we care for each year, a great many comforters are needed. We are looking for volunteer sewers as well as donations of material, batting and thread. You can also make a monetary donation earmarked specifically for this project. If you can help by sewing, donating or offering suggestions to make this program a success, please contact Kathy Shillinglaw at 414-649-8640. Thank you for creating a gift of comfort for a homeless animal in desperate need. You have increased her chances of adoption by helping her to relax so she can put on her best face for potential transfers. Want to be more involved in helping provide resources for the animals at MADACC? Consider joining Friends of MADACC (FOM). FOMÂ supports a network of volunteers that provide educational programs, training, foster care, dog walking and cat socialization to enhance the quality of life of animals at MADACC.Â Their goal is to increase the number of animals transferred or adopted from MADACC and prevent animal cruelty and neglect. Go to the Friends of MADACC website for more information.